A new report in the journal Emotion suggests that teens who spend less time in front of their screens are happier—up to a point. The report, “Decreases in Psychological Well-Being Among American Adolescents After 2012 and Links to Screen Time During the Rise of Smartphone Technology,” used a large national survey of eighth, 10th and 12th graders conducted annually by the University of Michigan. After rising since the early 1990s, adolescent self-esteem, life satisfaction and happiness plunged after 2012, the year smartphone ownership reached the 50 percent mark in the United States, the report said. It also found that adolescents’ psychological well-being decreased the more hours a week they spent on screens, including with the Internet, social media, texting, gaming, and video chats. The findings correlate with earlier studies linking frequent screen use to teenage depression and anxiety. No one has to do research to know that the use of electronic devices has mushroomed in the past six years. The percentage of teens who had smartphones jumped to 89 percent at the end of 2016, from 37 percent in 2012 to 73 percent in 2015, according to data from the Pew Research Center and the Associated Press-NORC Center for Public Affairs Research. 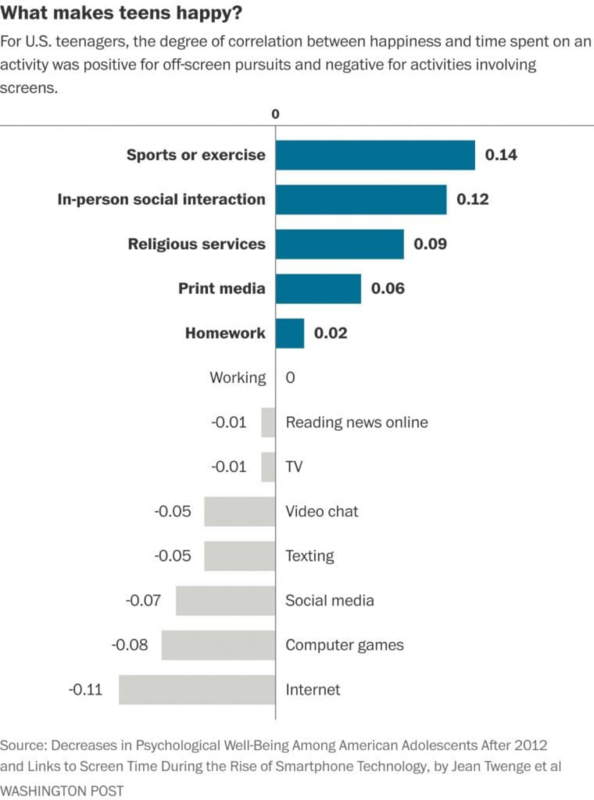 But the Emotion report went further than simply reporting the number to graphing the correlation between happiness and screen activities (even non-screen activities such as sports, in-person interactions, religious services, print media, and homework). For all the non-screen activities, the association was positive; for the screen activities, it was uniformly negative. This relationship of screen versus non-screen activities is called “zero sum”—meaning, if you are doing one, it takes time away from the others, said Jean Twenge, a psychology professor at San Diego State University and the study’s lead author. Diane Tanman of Chevy Chase, Md., worries this is the case for her sons, 11 and 15. “Like playing games in the field like they used to when they were little—they used to do that, and I think it made them more happy,” she said. As with any addiction, breaking away can be hard. Ed Lazzara of Salem, Ore., says his 12-year-old son, Leo, a fan of the game Minecraft, is more irritable after he has been playing a lot. “It’s like interacting in the real world doesn’t have that zing, you know?” Lazzara said. The greater unhappiness among those with no screen exposure could be due to several factors, Twenge said. “It could be that they are left out of the social scene of high school, that it’s very difficult to carry on friendships in high school these days without texting at all or being on social media.” It is also possible that those kids are outliers, she said—teens with special needs or in special education, or those whose screens have been taken away from them by parents. The happiest teens, according to the report, are those who are above average in face-to-face social interaction time and below average in social media use. Amanda Lenhart, deputy director of the Better Life Lab at New America who has conducted studies on teenagers and screen use, called the report interesting but said it is hard to separate screen time from other stressors that may affect teenagers’ happiness, such as the political or economic landscape. “The culturally easy scapegoat right now is the technology—it’s new, it’s scary, it’s changed our lives, it’s changed our kids’ lives,” she said. In many ways, some sort of screen time is built into being an adolescent. Many schools require students to be online and to use iPads, Chromebooks, or other devices to do their work. But teachers have also decried the distraction that technology can become when students use their devices in the classroom for things other than their studies. Technology-free schools do exist—including some in Silicon Valley that tech titans have sent their own children to. And movements such as Wait Until 8th have urged parents to delay giving smartphones to kids until high school or just before. But even Bill Gates, who is known for limiting his children’s access to technology, allowed them to get phones by age 14. However, she and her husband decided to relax her rules against gaming after helping their niece move into college at George Washington University and noticing that “every boy was carrying around an Xbox . . . and suddenly there was no monitor. 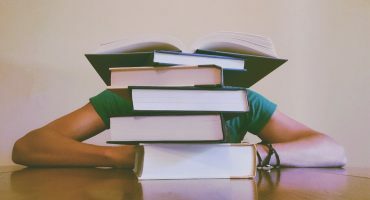 It’s like drinking; nobody’s telling you no.” They decided it was better for their son to learn to regulate his gaming in high school, when he still had parents to help, than to have to learn how in college when no one was watching. Their son also has a smartphone and a laptop; their daughter has a phone with no social media accounts. “It’s all around them, and they are going to have to learn to live with it in their society,” Bowsher said. But the finer points of screen use in today’s society are still evolving. Recently, investors in Apple, the maker of the iPhone, signed an open letter demanding more options for parental regulation of phones, such as the ability to limit their use to certain hours or shut off social media access at a certain time each day. The letter, which Twenge helped draft, cited research showing negative psychological effects of phone use on teens and noted parents’ “constant battle” over screen time, calling it “unrealistic and a poor long-term business strategy to ask parents to fight this battle alone.” Apple responded by saying it is planning new enhancements to increase parental control.